The Buddhic level is THE source of happiness and bliss for the Manasic/Higher Mind, Causal/Soul, Mental/Intellectual, Astral/Emotional, and Physical levels. It is the plane of bliss. Unity is so real and intense on this level that you are in a state continual ecstatic union with others. It is a state of intense love and continual total-being orgasmic ecstasy. 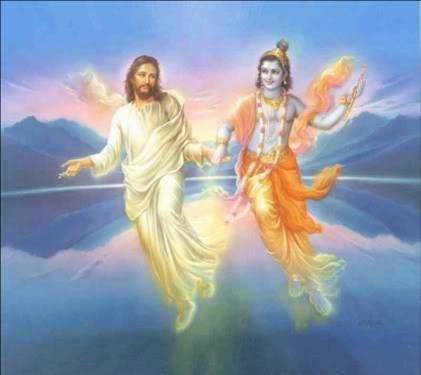 If what is thought to be Buddhic or Christ consciousness does not include this experience of intense orgasmic bliss then it is not actual pure Buddhic/Christ consciousness but rather its reflection in the Mental or Astral levels, or a mixture of Buddhic with Mental or Astral levels. Buddhic/Christ consciousness is a state of ecstatic individual self transcendence. It resides in the Buddhic Universe which is filled with golden and white light, profound wisdom, swirling mandalas of groups within groups within groups of light-beings. When awakened, the Buddhic/Christic body can be perceived as a large conglomerate of spinning vortices pointed outward. The cone shaped structures, in the image above, are vortices of energy. This body is extremely elastic, and when its attention is directed to an object (on its own level or mental, astral, or physical levels), it expands and elongates and travels to the object faster than the speed of light or the speed of thought, then the vortices tunnel into the object facilitating an immediate unification and merging with the object of attention. A central column of light-energy signifies its current range of consciousness. Rarely are Buddhic bodies seen alone, as depicted above. They are normally dynamically interacting with groups within groups of other Buddhic beings. It has a total of 6 spatial dimensions.